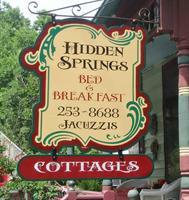 At Hidden Springs Bed and Breakfast, you will delight in exceptional service, slumber in quaint & immaculately clean cottages or suites, and treasure privacy. Each cottage/suite has a private exterior entrance, so that you may come and go as you like…even late into the night. Moreover, the next morning, at the specific time of your choosing, a scrumptious breakfast will be delivered to your suite or cottage. Your ''breakfast in bed'' feast will include: a variety of delicious pastries (baked that same morning at one of Eureka's fantastic bakeries), a generous serving of farm-fresh pepper-jack eggs, as well as fruit, supreme roast coffee, and juice.